Mia brought her 18 (that's right, eighteen) friends and they enjoyed a private tour on their recent cruise stop at Progreso. Once again, Angel proved to live up to his name. We thank you guys for an awesome experience . Angel was the best and so was Joseph and Jorge. We enjoyed our tour, they were very nice to us providing our needs even before we ask for it. The ruins were beautiful and the cenote was magical, the kids had a blast. It was an experience that we will cherish forever and Angel and the guys made it all possible. Please give our thanks again to Angel, he was the perfect guide very knowledgeable and very helpful, willing to do everything to make this a special experience for everyone. He even worries about my mother In law who has knee issues, he made sure she has somewhere to seat under the shade at the same time too, not missing out on what she could get from the tour. Our 2014 family annual vacation for a group of 19 people, 8 teen agers, 8 adults in their mid 40s and three senior citizens 81 y.o, 72 and 71 year old was set for a cruise with Carnival Elation from New Orleans to Cozumel, Mexico and Progreso, Mexico. The excursion choices for Cozumel was overwhelming because there’s just so much to choose from, but our family decided will do our own snorkeling adventure at Chankanaab National Park. It was a totally different story with the Progreso stop because there were very few choices for excursion and from the reviews they said Progreso is boring. So I have decided to do some research and found all the good reviews for William Lawson private tours here on TripAdvisor. That was just the start. So I decided to research some more and decided will give them a try. I contacted William Lawson tours and started corresponding with Adriana (who had been so helpful right from the start in deciding what we should do in Progreso) We have decided to tour the Mayapan ruins and swim in a cenote. August 26, 2014, we arrived in Progreso and got off the boat around 9:12 am , hop on a free shuttle bus to Auto Progreso terminal and there was Angel with my name boldly printed on a board, with his welcoming smile. I was so happy to have gotten him as a tour guide because I have read so many good reviews about him. We boarded our 15 seater van with Angel and our very friendly driver Joseph (they had two vans for our party of 19, the other driver was Jorge ) They have cold drinks, water, soda and native mexican flavored drinks for our 1 1/2 hour travel to the Mayapan ruins. Angel was sharing tons of information with us all throughout our travel, you can very well see his love of his culture and he is very knowledgeable too. We appreciated every little information he was able to share with us and we asked him the silliest questions too and he did not mind that at all. The Mayapan ruins was more than what I imagined it would be, it was beautiful and serene. It was very peaceful there too (no vendors) it was just our party of 19 and three other tourists. Angel even set up a place for my mother in law to sit under the shades because her knee is bothering her and she can not walk far (That was very thoughtful of Angel) The kids and adults climbed every structure and took tons of photos. Angel was our personal photographer too (among his many talents). We explored the different structures and we also found some iguanas. It was very hot that day (felt like we are inside an oven) and we were all dripping with sweat and on our way back to the vans Joseph and Jorge has prepared some watermelons, bananas, frozen chocolate covered marshmallows and a whole lot of drinks for us thirsty tourist which was so nice after being exposed to the extreme heat. On our way back to the port, the kids wanted to try authentic mexican tacos and burritos (can’t believe they want to eat some more ... teen agers LOL ) . Angel stopped at El Trompo, the food was really good (loved the beef taco)and nothing like the tacos we have here in the US just beware of the sauces, they are really spicy. Before we enter the port, Angel even bought custard apples for all of us that we devoured in few minutes (so good). What can I say about Angel of William Lawson Tours ..... he is the best !!! He is not only very knowledgeable as a tour guide, he is kind, thoughtful and provides things even before we ask for it. I highly recommend him and the tour to everyone visiting Progreso. Hopefully we’ll get to visit again some day and explore more with William Lawson tours . Birds and more birds! An absolutely incredible experience! From the Carnival ship, a pair of birders set out with our intrepid birding expert David, and this is what they had to say! I want to thank you again for arranging my recent birding tour. I had an absolutely incredible experience. David’s expertise was exquisite. He found us over 60 species of bird during the 7 hours or so we had, despite the rainy and overcast weather. It was more than I could hope for. I would really love to post some sort of review or description of my experience on your website. David mentioned that ours was the first strictly birding tour that your company offered, so I hope my review will help other birders choose you for their tours. Is there any means of me providing such a review to you? Thank you again and I will be sure to recommend you to my friends and family. I will likely be back again myself! 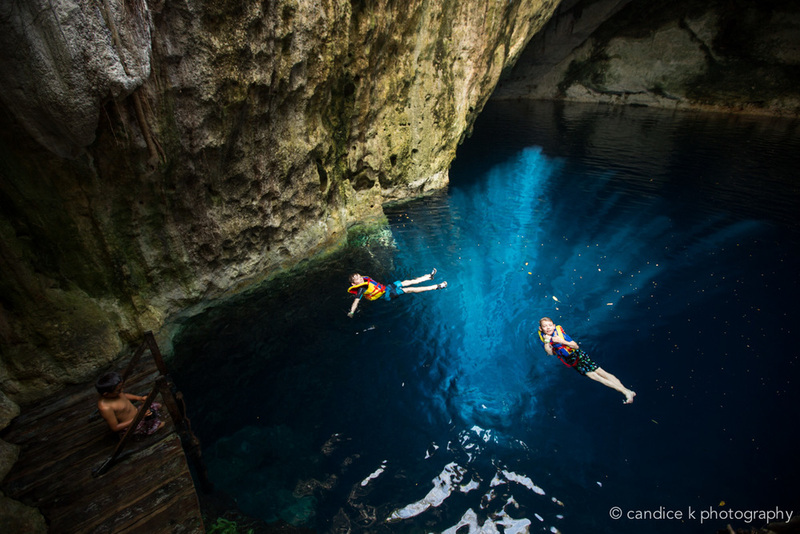 The cenote at Dzibilchaltun - refreshing on a hot day! Last July (Yes, it has taken me this long to get this posted...) my family went on a cruise to Progreso, Mexico and booked a tour with Lawson for our day on shore. I had been to Progreso before and taken the ship’s tours and without a doubt, taking a tour with Lawson was by far better. I corresponded with Ralf before the trip to plan our excursion and he developed a tour that was perfect for our family. We decided to visit a local marketplace, a couple of cenotes and a small Mayan ruin. Our family consisted of our parents which are in their late sixties and our four children which ranged in age from eighteen to eleven, my husband and myself. We drove to a local market and got to walk around and sample some of the local fruits and vegetables, drinks and food. We felt safe the entire time which was important to us because of a previous trip and tour that had given us a few causes for alarm. We ate pork sandwiches and drank local made juices (there were about four different types that we sampled) then we visited a couple of different local vendors in the market square. We visited a turn of the century church and was serenaded by a local farmer. As we drove to our first cenote, Ralf was able to handle our multitude of questions and Angel stopped here and there to gather samples of leaves and fruit from local trees and bushes. We were able to sample and handle some of the most interesting and delicious vegetation. The first cenote we visited was basically just a large hole in the ground filled with crystal clear water that looked like a filled cave once you were in it. There was a latter and ropes strung across the top of the water. 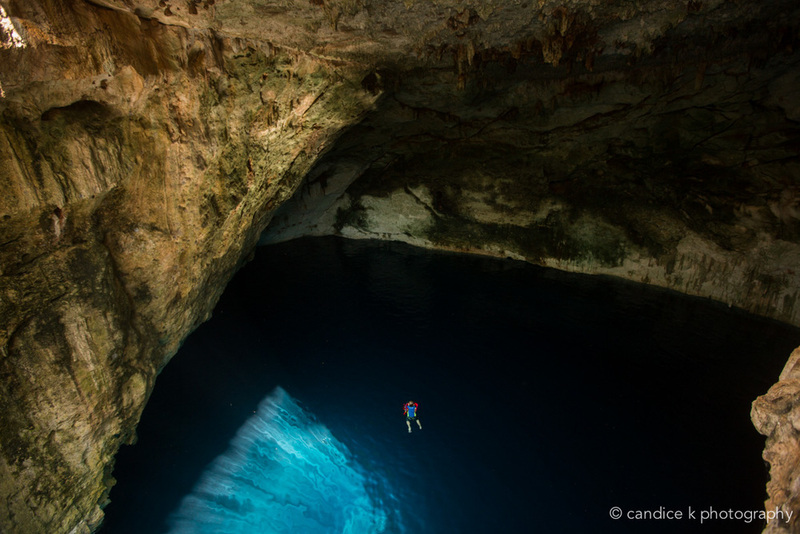 There were divers there to dive into the caverns below. 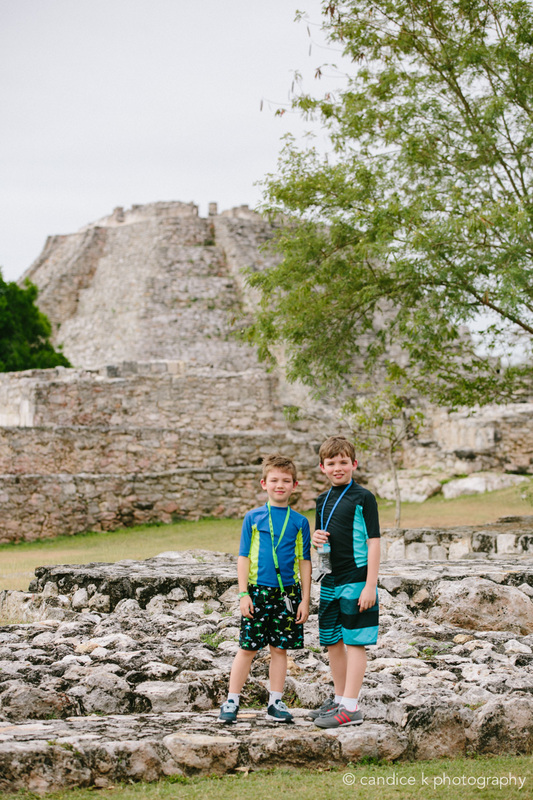 Our children had the best time jumping into the cenote and swimming. Our parents sat on a rock wall and enjoyed visiting with Ralf and Angel and a few other local people that were there to enjoy the day. I appreciated the fact that this cenote was secluded and not crowded as we were able to enjoy ourselves without dodging the multitudes that seem to congregate at such beautiful sites. Ralf brought towels for us and had cold drinks to share as we climbed back into the van to head to a small Mayan ruin, Dzibilchaltun. I just began a new teaching job that included covering the Mayan culture and Angel was like a lifeline for me as we toured this ancient settlement because my questions were never - ending. 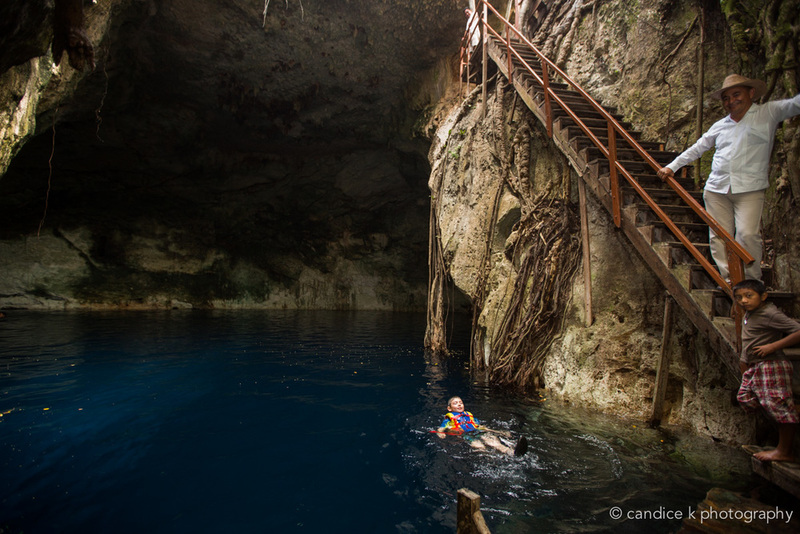 Angel patiently answered EVERY one of them and Ralf was generous enough to herd our four adventurous children on to the cenote within the settlement that had little fish that liked to exfoliate the dead skin from your body which tickles tremendously. We joined them to cool off from the heat and relax for a while. Our parents took the opportunity to do some photo taking because the scenery is beautiful there. We loaded back into the van, stocked with cold drinks and headed back into the city for a little shopping time before we had to get back on the ship. I just wanted to let you know how pleased I was with our day with Gener. He was very welcoming and an open book of information he shared with us about Merida and all of Mexico. I am sure all your clients are pleased with what William Lawson tours offers. The personal touch we were looking for was well provided. Although my tortilla making was less than stellar I had a blast. I will definitely be in touch again when we are able to return. There is much more to learn about your area. Ben and his family visited this fall and we had the pleasure of taking them on two tours of the area. Here are his impressions of the experience; we are truly touched by the way we were able to make this much more than a simple vacation day trip. Thank you Ben! Wondrous and miraculous. That’s the experience William Lawson Tours provided my family this past week in Progreso Yucatan. I’m not hyperbolizing. First, the wondrous part. Our guide, Angel, took us on two fantastic excursions. The first was to the ruins at Mayapan and two cenotes afterwards. Both were fantastic experiences. Angel’s knowledge of Mayan history and culture was awesome; he answered every question and made observations that enriched our experience. We were the only people at the cenotes, and my two young adult sons had a blast, leaping 30 to 40 feet into the dark cenote waters that seemed like something out of an Indiana Jones movie, only better. In between, while we were driving on narrow jungle roads east of Merida, Angel provided us with an impromptu snack, asking a local Mayan lady to make us some fresh habanero salsa with chaya & scrambled egg tortillas, which we ate at a hacienda in the early stages of restoration. It was quiet and real, yet other worldly. On our way out, Angel stopped along a little road and stripped one henequen leaf down to its sisal fibers, twisted it, and knotted it at one end, showing us in just a few moments, what brought great wealth to Yucatan when henequen was green gold for the region. As we drove along, I knotted the other end and have saved the tiny strand of twine as an invaluable keepsake of another time and another world. Our second excursion was to the Yaxcopoil Hacienda and the ruins at Uxmal. Uxmal was magnificent and not overrun, allowing use to roam freely and enjoy Angel’s explanations and story-telling. Again, the stuff in between was every bit as enriching and stirring. We stopped at a magnificent hilltop vista above the town of Muni, and explored the lovely creations of an artisan there (his name escapes me). We stopped at a tiny village tortilleria for fresh tortillas right off a rickety conveyor belt from an oven that made the little place about 130 degrees. We also stopped at Hacienda Ochil on our way back to Merida. I was gratified to see the narrow gauge rails and the corroding carriages that once carried visitors, workers, henequen leaves, and raw sisal fibers from the fields to the main hacienda and the warehouses where the fibers were processed. I’d seen these things in pictures on the internet, but it was fantastic to see these artifacts up close, with my own eyes. The last 10 minutes of time with Angel were yet another gift. He knew we were tired (my wife and I are thinly disguised oldsters), but after getting our okay, he drove us, in the mid-afternoon, through incredibly narrow and congested streets near the city’s center, but not the part with the fancy cathedrals and colonial state buildings, but the working class part. The streets teemed like an alive river, with thousands of people going about their hard-working lives: vendors, workers returning to work after siesta, women lugging home groceries for that night’s dinner, and the best part for me — hundreds and hundreds of school children of all ages, just dismissed from their day’s studies, the adolescent ones talking together excitedly and hanging out, and the younger ones holding a parent’s hand while they jostled their way home. Those 10 minutes touched me deeply, seeing that river of life, and glimpsing the hard working and generous hearts of the Yucatecan people. But wait, there’s more. The miraculous part. I didn’t come to Progreso or Merida to see the sights. I came to Progreso with faint hopes of finding my long lost paternal grandfather, a Chinaman, who lived for 55 years in Progreso and who passed away there 23 years ago. My family and I found his little flat on Calle 35; we had an address. But we couldn’t find his headstone in the Cementario Generales, despite an afternoon of searching. I gave up hope, except for one last thing to try. Before our first excursion, I asked Angel if he could drive me to the library in town, so I could ask if there was a directory of any sort for the cemetery. Perhaps I might find my grandfather that way. No problem, Angel said. On the way there, he pulled over and picked up his friend, a gregarious man name Pedro M.
Angel and Pedro are aptly named. One is a celestial helper and the other is a saint. Within an hour the two of them guided me to Progreso’s municipal offices, where we found the record of my grandfather’s death and also his last residence, the town’s nursing home. Angel and Pedro helped me secure a certified copy of my abuelo’s death. Not only that, but Pedro also secured the name of the man who helped bring my grandfather to the nursing home when he faltered. Angel and Pedro then drove me and my family back to Cementario Generales. There, one of the municipality’s managers, whom Pedro miraculously summoned during all this, led us to the necropolis’ western edge, where we found my grandfather’s final resting place. I could hardly speak, I was so surprised and moved. The manager asked me if I would like some flowers. I said yes and looked around towards the outer streets, knowing from our fruitless search the day before, that there were no convenient flower vendors, such as one might find in an American cemetery. The manager simply stepped up on an elevated slab nearby, climbed briefly onto a tree, and plucked 4 beautiful blossoms and gave them to me. They looked like gardenias, and they were lovely, white. For Chinese folks, white is the color of mourning. How did he know? Later that night, Angel and Pedro introduced us to an open-hearted woman in Progreso whose family is the only one of Chinese heritage in Progreso today. We have the same last name! My grandfather knew her grandfather, we were certain, and likely worked together for a while in Merida’s Chinese Colony. 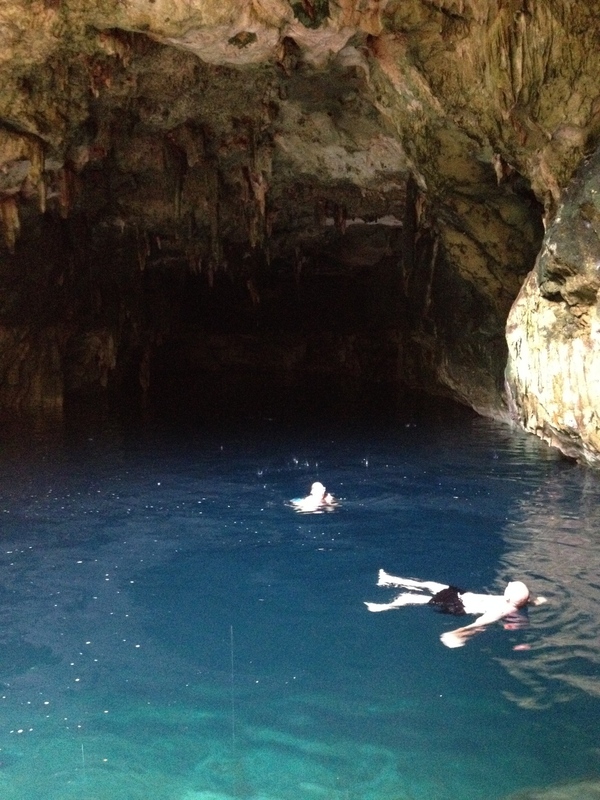 Jessica and her hubbie came in on the Carnival cruise ship and visited the cenotes. Here are her comments! Thank you again for everything, your business really made our trip special and priceless. The balloons were so thoughtful, that was very sweet of you, thank you so very much. We are definitely going to spread the word of your awesome business and review you as much as possible online. Thank you again for everything, we will for sure contact you if we are in the area again.